HOLLYWOOD, Calif. (March 26, 2013) - The fabled siblings are all grown up and hell-bent on tracking and killing witches wherever they hide in the no-holds-barred epic of modern action and adventure Hansel & Gretel: Witch Hunters , taking flight on Blu-ray, Blu-ray 3D, DVD and On Demand June 11, 2013 from Paramount Home Media Distribution. The film will also be available early for Digital Download on May 21st. "Destined for cult status" (Rick Florino, ArtistDirect.com), Hansel & Gretel: Witch Hunters is filled with "super crazy action and mind-blowing thrills" (Shawn Edwards, Fox-TV) and stars Jeremy Renner (The Avengers, The Bourne Legacy), Gemma Arterton (Quantum of Solace), Famke Janssen (X-Men), Thomas Mann (Beautiful Creatures) and Peter Stormare (The Big Lebowski). Written and directed by Tommy Wirkola (Dead Snow), the film earned more than $200 million at the global box office and a sequel is in development. The sly and ingeniously wicked movie tells the story of the brother and sister team seeking to avenge their parents' deaths. But after a lifetime of hunting witches, Hansel and Gretel now must face an evil greater than anything they've seen: a terrifying new threat so massive, it could destroy the world as we know it. 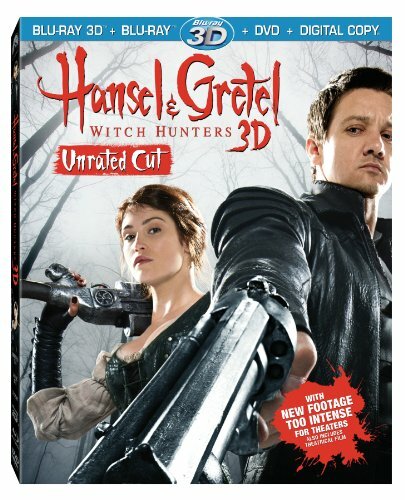 Hansel & Gretel: Witch Hunters will be available in both its original theatrical version and an unrated version with never-before-seen footage that was too intense for theaters in a Blu-ray/DVD combo or a three-disc Blu-ray 3D/Blu-ray/DVD combo, both with UltraViolet(TM). The combo packs boast revealing special features that take audiences behind-the-scenes for a look at the reinvention of the story, an in-depth examination of the gruesome witches and an up close and personal visit with the extraordinary troll, Edward. The film will also be available as a single-disc DVD that includes the theatrical version of the film. The Blu-ray releases available for purchase will be enabled with UltraViolet, a new way to collect, access and enjoy movies. With UltraViolet, consumers can add movies to their digital collection in the cloud, and then stream or download them - reliably and securely - to a variety of devices. Paramount Pictures and Metro-Goldwyn-Mayer Pictures present A Gary Sanchez Production "Hansel and Gretel: Witch Hunters 3D". Executive Producers Denis L. Stewart, Chris Henchy and Tripp Vinson. Produced by Will Ferrell, Adam McKay, Kevin Messick and Beau Flynn. Written and directed by Tommy Wirkola.